who is Zambala in Tibetan Buddhism, and why this website is named Red Zambala, I will tell you. Zambala in Tibetan Buddhism is commonly regarded as a God of Wealth. As a celestial being, a king of North, he has followed Buddha and reached a state of mind near to enlightenment. And now out of deep compassion and generosity Zambala is serving as a heavenly guardian and protector to all living beings. He is usually approached for a wealth, treasures, good fortune and good living. Zambala practice can remove poverty in all six realms and increase your merits, wisdom, compassion and lifespan. Green Zambala is the manifestation of Amoghasiddhi Buddha. He made a vow in front of Buddha Shakyamuni that he will protect anyone who chant his mantra or chant his name. He is usually shown in tight embrace with his consort and carrying a jewel producing mongoose in his left hand. When you are in difficulties, it is advised to chant his mantra as much as possible. This practice will help to all beginnings to be perfectly accomplished and purify all bad luck and obstacles, prevent theft, bad debts and loss of wealth. White Zambala according to the legend was born from the right eye of Chenrezig, the “Compassionate Eyes” or Avalokiteshvara. He sits on a snow lion and holds a mongoose in his left hand that spits out precious gems for the poor and needy to collect. According to the sutra, his mantra can stop suffering, destroy bad karma and develop a strong Bodhichitta. The Yellow Zambala is considered the most popular and powerful of the Wealth Gods. Yellow Zambala is the manifestation of Buddha Ratnasambhava. He is protecting the dharma and if anyone chants his name, he will come and help this person. If you have trouble with finance or anything, you can repeat his mantra and he will come and help. But you must have compassion and practice Buddhism properly to receive his blessings. You can also gain wealth, wisdom, intelligence and attain Buddhahood. Yellow Zambala is sitting on a lotus, sun and moon disk. He holds a mongoose in his left hand and from its mouth spews forth precious jewels. Black Zambala is the manifestation of Buddha Akshobhya. Black Zambala is sometimes called the chief of the five great Zambalas as it is said he has given people wealth and happiness. He is also identified as Hindu god of wealth, Kubera. He will fulfil your wishes, make you happy, and give you wealth and prosperity if you meditate on him and repeat his mantra. He has been portrayed standing on a corpse with a Kapala (a cup made from a human skull) in his right hand along with the mongoose in his left hand. He is also usually pictured being surrounded by a ring of fire. He is black in colour, as his name tells it. 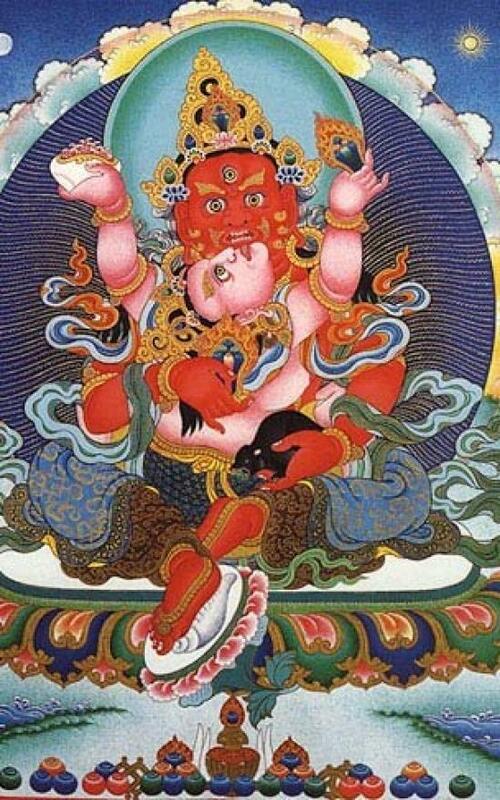 Red Zambala is the manifestation of Dorje Sempa, the Buddha of Purification. He has two faces and four arms and holds a treasury mongoose on his left hand. His Tibetan name is “Zambhala Mapo “. If you repeat his mantra a lot, you will be protected by him and also gain wealth and you can have a very good life and become famous. Some people believe he is the Hindu God of Wealth Ganesh. Others picture him as having two faces and four arms. He also carries the mongoose in one of his left hands. Besides meditating on Zambala, visualizing and chanting mantra, it is also a popular practice to pour water over the head of the Zambala statue. Or to place a Zambala statue under the falling water of waterfall with six steps. According to Sutras, once when Buddha Shakyamuni was teaching the Maha Prajna Paramita Sutra, his jealous cousin Devadatta was throwing rocks at the Buddha. At this time Zambalas appeared in front of Buddha and protected him. But some rocks hit the White and Yellow Zambala in the head and the Black Zambala in the stomach. When it happen, Zambala fell down to the ground. Lord Buddha came over to Zambala and blessed him - and from Buddha’s hand came a white, nectar-like substance of wisdom and compassion and love and touched Zambalas head. When it touched Zambalas head it made him feel very blissful, very happy, very calm, and cleaned his impurities and cleaned his obstructions and healed his wounds. Immediately Lord Zambala bowed down to Lord Buddha and thanked him. That's why White and Yellow Zambalas feel bliss when water offering is poured on their heads. This eases their pain. For the same reason for Black Jambhala, water should be poured onto his stomach. You should also always remember altruistic intention in your mind. That you are practising in order to be able to practise Buddha teachings and be able to help your family and other sentient beings.